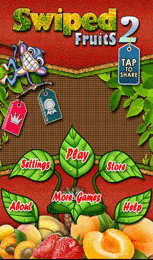 Swiped Fruits 2 from the makers of Swiped game series, massive upgrade and sequel to popular Swiped Fruits game. 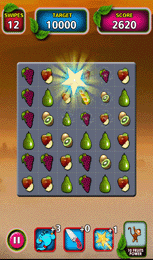 Swipe delicious fruit puzzle challenges to unlock awesome new game modes like Word Mania, Reveal It & Bring It Down. 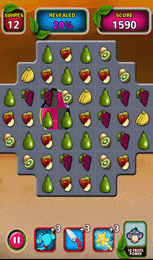 Swiped Fruits2 Support : Runs in over 4000 android mobile devices. Classic, Frozen Fruits, Word Mania, Fruit Mania, Reveal It, Bring It Down, Freezing Fruits, Reducing Fruits & Score Panic. 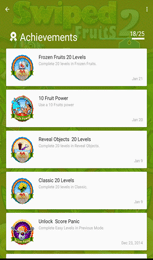 Pass normal levels in classic to unlock Frozen Fruits and play on to unlock all game packs. Unlock sucessive packs by passing normal levels in each pack. 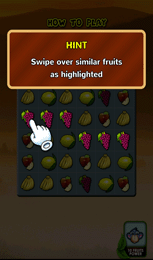 Touch and swipe over similar fruits to clear them. 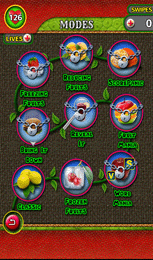 Excite 10 fruit powers by swiping over them along with similar fruit chains. Play in 9 challenging game packs with unlimited levels. 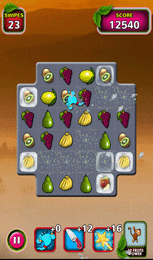 One of the Four unique 10 fruits power in each level. Google play leader boards and achievements for all game modes. Share this game with friends and compete with them for top scores. Ultimate mind game quests for passing time.